Makes moving, tilting and draining drums an easy one-person job. All double-welded 1-1/4" diameter tube steel frame. 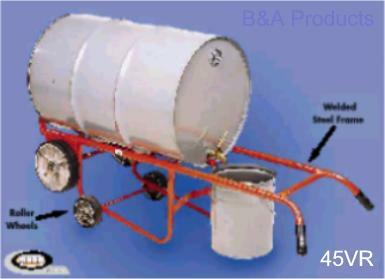 Polyolefin roller wheels allow you to easily rotate the drum to draining position. Special chime hook fits under spigot, won’t interfere with draining. Drain height 14". (Please note, however, that the standard 5 gallon poly pail will not work with this truck). Stores upright with built-in kickstand. Truck measures 62" high x 24" wide (16-1/2" wide at nose). Main wheels are 10" diameter x 2-1/2" wide. Rear wheels are 6" diameter x 2" wide.